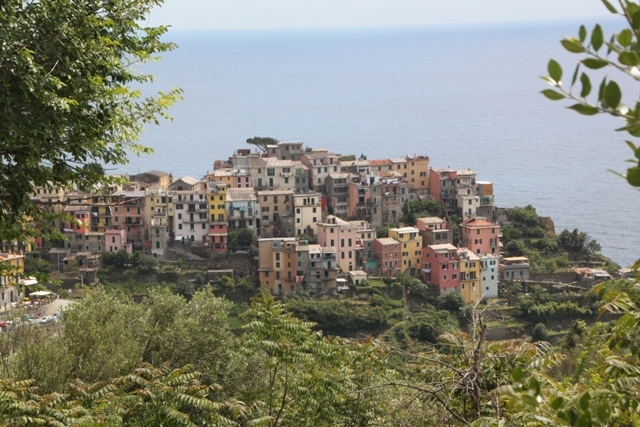 We didn’t stay in the Cinque Terre proper, our base for this trip was Levanto. I would like to say this was all down to my excellent planning and organisational skills but that would be a big fat lie. Quite the opposite if you want the truth. When our search for a place to stay was underway (a month or so before our trip), we were astounded to find just about everything in every hamlet was booked. Apart from a few seriously dodgy looking apartments there was no room at the proverbial inn. We started looking further out, stumbled upon Levanto and ended up staying there. A really quaint little town, it has a beach which is good but even better the accommodation options are seriously cheaper. 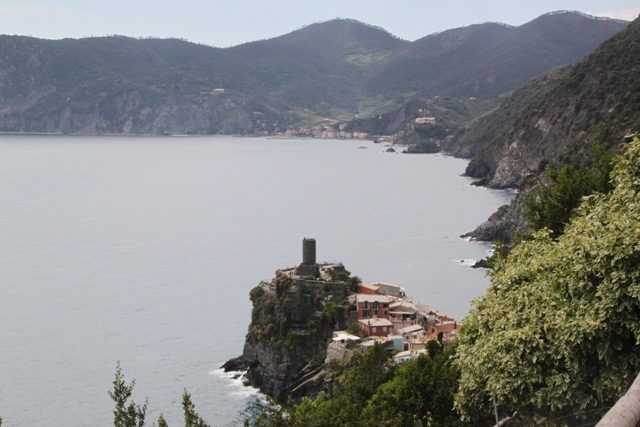 It is just ten minutes by train from Monterosso (the nearest Cinque Terre village) and twenty minutes from Riomaggiore (the furtherest away) and the trains are frequent. We found plenty of nice restaurants, a great playground in the centre and a chilled out vibe in the evenings. All this plus no crowds, Levanto would be my choice if I wanted to stay in this area again. We usually hire a car on European jaunts, decided not to bother this time and boy was that a good idea. You definitely do not need a car here. The mountain road connecting the five villages looked horrendously narrow and winding – not for the faint hearted. Cars are banned from the centres of the villages anyway so parking becomes something else to worry about. We got here by train and travelled around by train – easy and hassle free. It only took us an hour and twenty minutes on a direct train from Pisa to get to Levanto – a simple and chilled out journey, then we also used the trains a fair bit going from village to village. 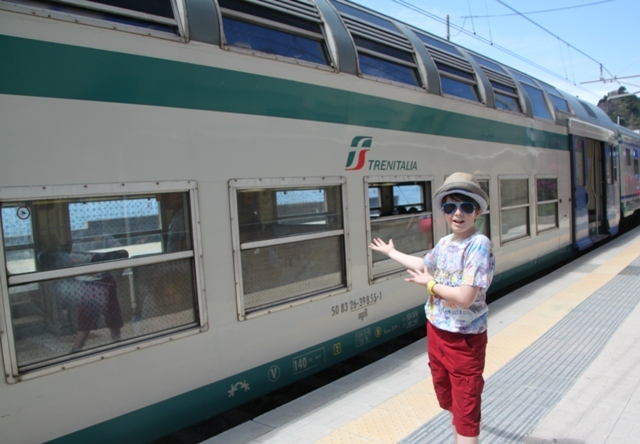 The Genoa to La Spezia railway line stops at each village, the trains are really frequent and best of all for Son, sometimes we even got to ride a double-decker. We bought a two day Cinque Terre card at Levanto station on our first morning. With this you can hop on and off the trains, ferries and trails (you have to pay for entrance to some of the trails) between the villages. You can also use the shuttle bus from the railway station at Corniglia up to the centre of the village. The Sentiero No 2 is the most popular trail and the one we hiked. This trail is 11 km long and in parts goes up and down a fair bit – some parts require a moderate degree of fitness, others are suitable for everyone. Even if you have young kids, I think you should definitely hike some part of this trail. The best Cinque Terre views are from here and it is one of the most scenic hikes I’ve ever done. You don’t have to hike the whole thing at once, you can do a part, then hop on the train or ferry at the next village – this worked really well for us and became fun for Son rather than an ordeal. Be sure to check the trail conditions before setting out – the local tourist office is usually helpful. 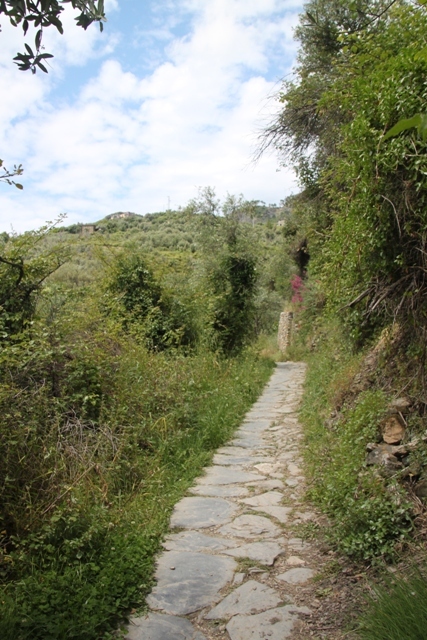 Heavy rains can affect the paths – two significant paths were closed during our visit due to landslides. We didn’t know about one of the closures in advance so big disappointment all round – again my pre-planning left something to be desired. You don’t need any special kit to hike the trail. I was concerned about walking boots and other such stuff pushing our (already meagre) budget airline baggage allowance over the top so left them at home. This was fine – trainers worked for me, Husband and Son wore sports type sandals and we had no hiking issues. Hats, sunscreen and gallons of water were the only other necessities – there is not much shade to be found anywhere and parts of the trail are remote, so water was our saviour. 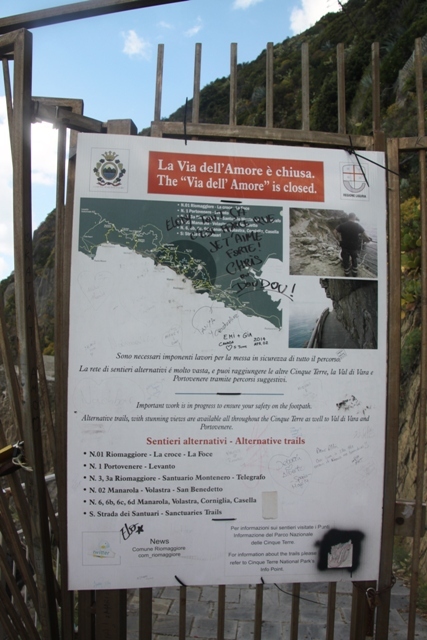 If you want an easy section to hike which is suitable for all ages and supposedly even strollers, then the Via dell’Amore is the one for you. Well that’s what I read anyway, we arrived at this section and found the gates firmly locked – another of those pesky landslides. All the hamlets slope down to the sea except for Corniglia. This is perched right on top of a tall cliff. I definitely think they are all worth exploring, strolling around and spending time in. Every hamlet is a bit different, I thought by the time we had seen four of them we would be blase, definitely not so, each and every one of them was lovely in its own way, offered something different and took my breath away. 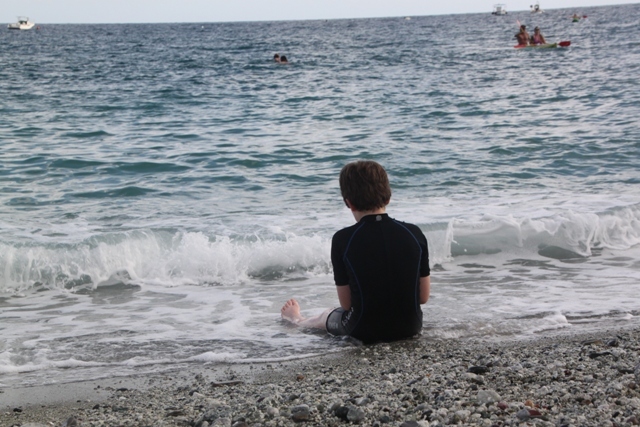 Having read Monterosso was the least charming I didn’t expect much, but was surprised at how much I liked it here too. Larger than the others, maybe not quite so quaint but definitely not lacking in beauty. If you wanted to stay in the Cinque Terre proper with kids, this would probably be the best option. It has a beach and more facilities on offer. A stay of three nights with two full days of exploring worked out well for us. We managed to do everything we planned – hike parts of the trail, visit all of the villages and explore them all, spend some time on the beach and fit in leisurely meals to boot. All that plus we didn’t have to be up obscenely early in the morning – something that works for this family with a day of hiking ahead. This is on my husband’s short list–now I’m excited about it too. Thanks! Great tips and great photos. It is gorgeous, one of the most beautiful places I’ve been, despite the tourists!! What a great post, great pics and lots of useful info too! Where are you off to next?? Thank you! 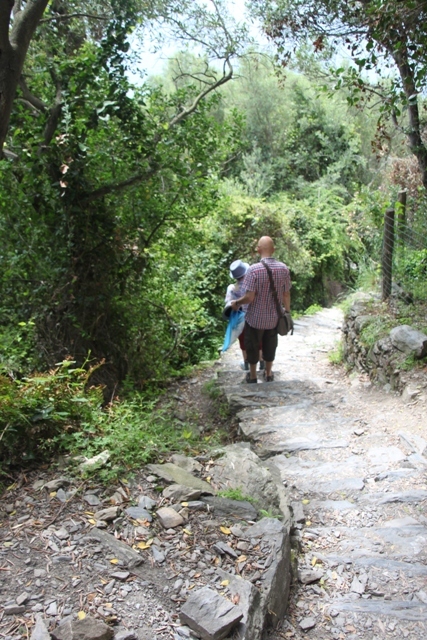 We loved the Cinque Terre, such a gorgeous place. Next stop on this trip was Florence – another wonderful city. Indeed! Florence is definitely a favourite and I see something new every time I go! I hope you enjoyed it and look forward to your next post! Great tip will definitely keep that in mind, I always wondered where it’s best to stay and Levanto sounds perfect 🙂 did you stay at a hotel or in an apartment? How much did you pay roughly? thanks! We stayed in an apartment, just in the process of writing about it in another post, it was ok but not perfect. We paid about 115 Euro per night but think had we been better organised we could have found something much better for the same price, or something equivalent a lot cheaper. Last minute booking though, we didn’t have too much room to manoeuvre! Ok, I’ll watch out for your next post then 🙂 €115 does seem quite expensive but perhaps is normal at the Cinque Terre? Have only stayed in Florence so far and I’m sure there’s much more accommodation on offer than in such a small town. Agree, last minute always works out more expensive, shame because many years ago once could snap up a good deal that way! I thought the same – we expected more for our money than we got for what definitely wasn’t cheap. However compared to other places we looked at this was reasonable!! I think maybe you need to be ahead of the game at the Cinque Terre, probably hard to find anything cheap, but last minute is for sure not the best way! Fab trip! Love it there…but only went to Riomaggiore….lots more for us to see….will refer back to your post when we go! 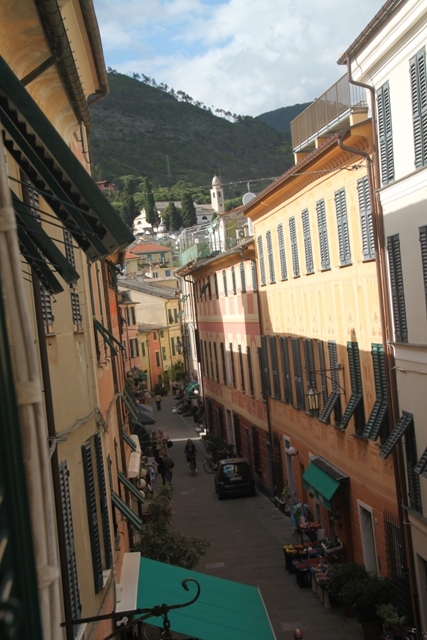 If pushed Diana I would say Riomaggiore was my favourite – but I did love all the Cinque Terre. Look forward to reading about your experiences when you return. We love Italy but have never been to this region. Your writing and photos have elevated this area’s position on my travel wish list. I didn’t know much about this area until I got hooked on WordPress travel blogs!! Glad I did though because it was so gorgeous and perfect for a trip. Definitely push it higher up your list! Thanks Jennifer! Trying to make a diary of our trips to look back on in the future, but really glad if you can find something in there that helps with your travel planning!! I second the previous comment 🙂 Between your posts on Pisa and Cinque Tierre, we can skip the guidebook! Thank you!! It is a lot of fun getting our travel adventures down in one place, if that helps somebody else too then it’s a bonus!! Glad you had a wonderful trip, the views are beautiful 🙂 I had to look up what country the Cinque Terre was in… Italy! I loved Italy when I went years ago and plan to go back; might have to take a detour to the Italian Riviera. I had barely heard of it either before this trip!! If you go back to Italy you should definitely try and get here, it’s gorgeous. It is gorgeous – but then I think it is hard to find somewhere in Italy that doesn’t fit this category!! Have a nice weekend. Wow thanks for the great tip! Its great to know about this the next time i’m there, I wouldn’t think of staying away from the towns but it’s a good idea! I always like it when its less touristic! We hadn’t planned to stay outside the towns but it worked so well – far less crowded and just as easy to travel around, would definitely recommend this. Some great tips here. My husband and I loved the Cinque Terre on our honeymoon trip. We didn’t make it there for our recent trip to Italy with the kids, but it’s definitely on the list. I’ll have to keep Levanto in mind for a home base. 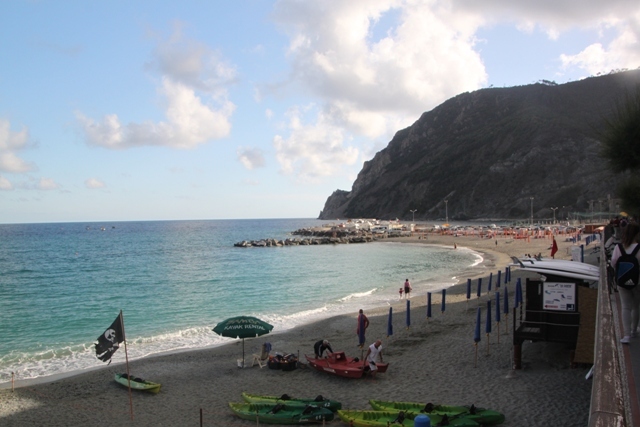 Levanto worked really well for us – would definitely recommend it. We loved the whole area too, so gorgeous! I absolutely love Italy! Love your pics! Thank you!! We love Italy too – don’t think there is any part of that country that isn’t gorgeous. It’s stunning – one of the most beautiful areas I’ve ever seen – you’ll have a great time I’m sure! I’m so excited. One of our friends said we had to go there and as soon as I saw pictures I knew we had to fit it into our itinerary!